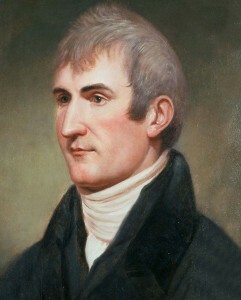 Lewis was a U.S. Army officer of great promise when he became personal secretary to President Thomas Jefferson, who knew the young man’s family and regarded Lewis as a protégé. Together, Lewis and the president planned a great expedition through the Far West, and when the Louisiana Purchase was approved, Congress financed the first overland expedition to the Pacific Northwest. With his handpicked co-captain, William Clark, Lewis led a small band from St. Louis to the Pacific and back —a journey that spanned 1804 to 1806. Lewis and Clark returned with a great narrative journal of the expedition, a wealth of scientific and geographical data, and the foundation of good relations with several Indian tribes. It was the opening of the American West.